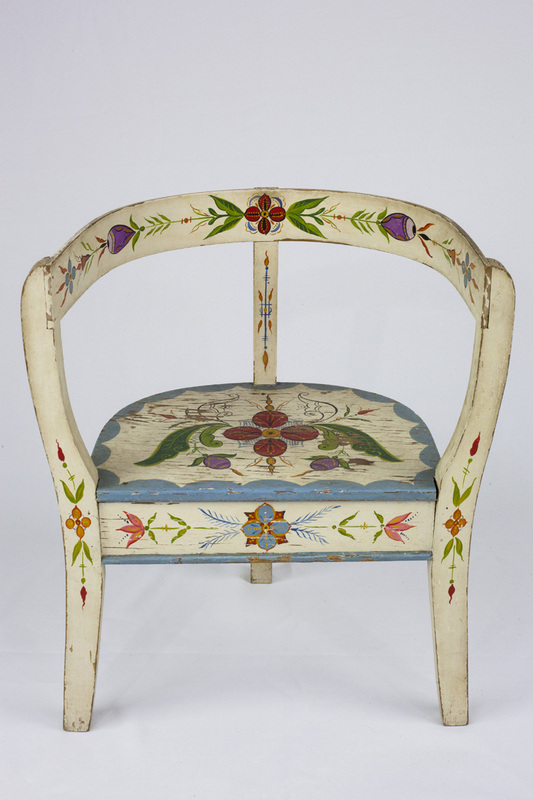 The revival of rosemaling in the United States is credited to the painter of this small chair, Per Lysne. Born in Norway in 1880, Lysne was trained in Norwegian decoration by his father. After immigrating with his wife to Stoughton, Wisconsin in 1907, he was initially employed as a wagon painter. In search of work during the Great Depression, he returned to traditional Norwegian decoration. Having faded from popularity, rosemaling reached astounding new heights in Lysne’s skilled hands. In addition to non-traditional items such as plates, Lysne also decorated traditional Norwegian objects including trunks, wooden boxes and three-legged chairs. The original owner of this chair was Agnes (Dahle) Green of Mount Horeb. It was later donated to Little Norway and exhibited for many years.